I enjoyed listening to the audiobook of How to Fail at Almost Everything and Still Win Big, which Amazon appears to be currently selling for just $3.84, HERE. Scott Adams, creator of the comic strip Dilbert and author of How to Fail at Almost Everything and Still Win Big is my guest this week on The James Altucher Show. Scott’s story is an inspiration for anyone that feels that they are stuck in their job and don’t know the next step to take. Scott worked in a corporate job for over 25 years before he was able to become a cartoonist full time. Flash forward 10 years and Adam’s cartoon, Dilbert, is syndicated in over 2000 newspapers. Before Scott was able to succeed, he failed at hundreds of different “good” ideas. But those failures are exactly what led him to his major success. When I entered the Fed-watching business over three decades ago, a clichéd phrase of advice from graybeards was: “Watch what they do, not what they say.” Thinking back, there was not actually much Fed rhetoric to either watch or hear. Muscles without strength, friendship without trust, opinion without risk, change without aesthetics, age without values, food without nourishment, power without fairness, facts without rigor, degrees without erudition, militarism without fortitude, progress without civilization, complication without depth, fluency without content; these are the sins to remember. As I've mentioned before, I think Richard Duncan's book The New Depression is one of the few macro-related things worth reading. THIS video interview he did earlier this year also does a great job of going over some of his ideas, for those who want a shorter version. And for an example of the way I think he's helped me understand some things that may or may not be directly useful to buying cheap stocks, consider the 3 slides below, which are from some of his Macro Watch videos. 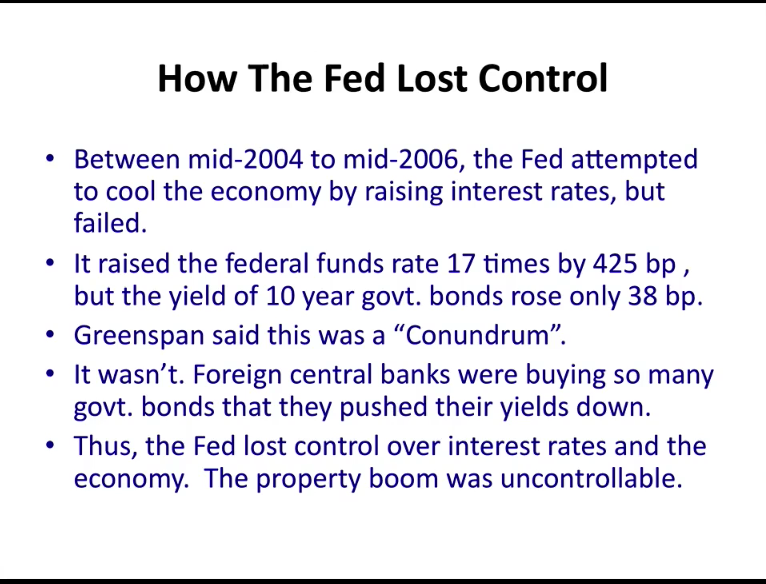 The first slide pasted below is a slide where Duncan talked about how the Fed, in the 2004-2006 timeframe, raised interest rates but couldn't get the market rates to rise by nearly as much as they had wanted. Alan Greenspan called it a "conundrum" at the time. The second slide pasted below essentially explains the reason for the "conundrum," at least according to Duncan. 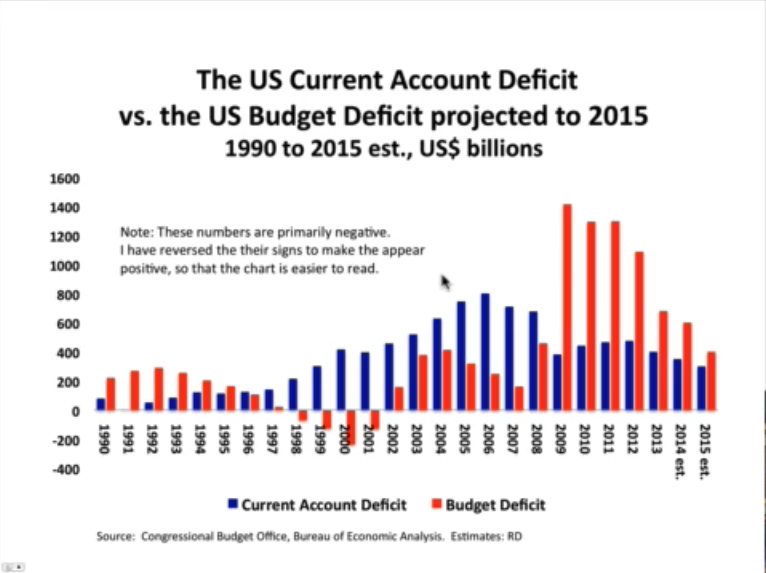 The current account deficit had grown increasingly large from 1996-2008, and exceeded the budget deficit by quite a bit. Foreign central banks (especially China) generally purchased U.S. assets with the U.S. dollars they received from running trade surpluses with the U.S. so that they could keep the value of their currencies down. 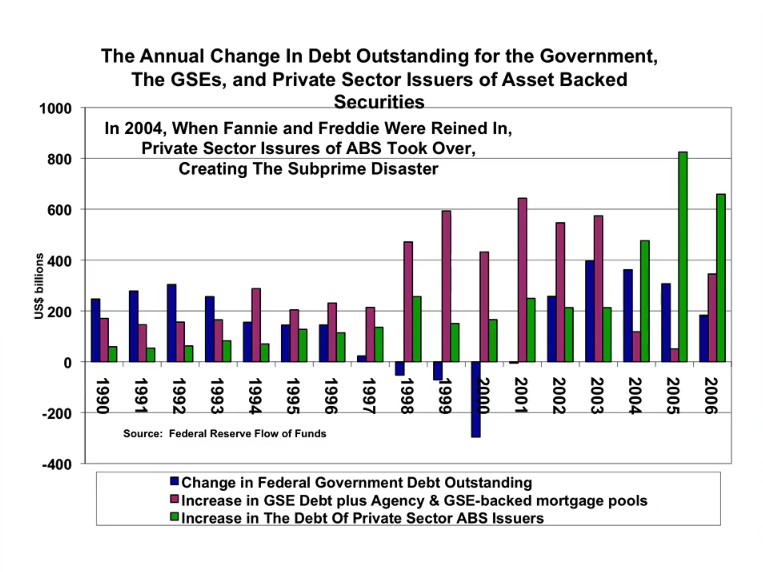 When there weren't enough new U.S. treasuries being issued because the budget deficit was lower than the current account deficit in the U.S., those foreign central banks had to purchase other things, which in general were previously issued U.S. government debt or those of Fannie, Freddie and private issuers of asset backed securities, as can be seen in the third slide below. In Poor Charlie's Almanack, one of his checklist items is to "Always beware of inflation and interest rate exposures." What Duncan's work has helped me realize is just how complex and how many moving parts there really are that can affect inflation, interest rates and other macro outcomes, and that even those at the top of the world's central banks can have a hard time figuring out what their actions will lead to. And getting back to QE, if you look at the second slide above, you see that the budget deficit exploded above the current account deficit when the Great Financial Crisis hit. That is where QE came in and without it, interest rates likely would have moved much higher as there wouldn't have been enough demand for the onslaught of supply of U.S. government bonds without Fed purchases. One more point that is useful for me is that I try to be as objective and humble as possible when looking at all of this stuff. It is interesting to learn, but also important not to form too strong an opinion on whether certain past actions were right or wrong, and especially important not to use what one learns to forecast what one thinks will happen in an unpredictable future. I think the key is to use knowledge gained to try and think about and identify risk, not forecast. In short, be a risk-identifier, not a forecaster. In the short run, a great deal of investment success can result from just being in the right place at the right time. I always say the keys to profit are aggressiveness, timing and skill, and someone who has enough aggressiveness at the right time doesn't need much skill. At a given time in the markets, the most profitable traders are likely to be those that are best fit to the latest cycle. This does not happen too often with dentists or pianists—because of the nature of randomness. The easy way to see this is that in boom times, the highest returns often go to those who take the most risk. That doesn't say anything about their being the best investors. Anyone who works in finance will sense, at least at first, the pressure to pretend to know more than he does. This week, Nassim Taleb, author of Antifragile: Things That Gain from Disorder, joins The James Altucher Show to talk about technology and how different systems handle disorder. Just as humans evolve, technology is constantly being upgraded and replaced with new concepts and ideas. Today, we use technology in almost every aspect of your lives. But do we really understand the advantages and disadvantages to constantly being computerized? In Nassim's book, The Black Swan, he highlighted for readers the unusual and unpredictable events that underlie almost everything about our world. Now with his book, Antifragile, readers are presented with why we should embrace these uncertainties. Sept. 22 (Bloomberg) -- Clifford Asness, managing and founding principal of AQR Capital Management, and John C. Bogle, founder of Vanguard Group Inc., talk about investment strategy, fund management and the outlook for pension funds. Bloomberg's Tom Keene moderates the discussion at the Bloomberg Markets Most Influential Summit in New York. Sept. 22 (Bloomberg) -- Leon Cooperman, chairman and chief executive officer Omega Advisors Inc., and Howard Marks, chairman and co-founder of Oaktree Capital Management, talk about investment strategy and the outlook for financial markets. Bloomberg's Stephanie Ruhle moderates the discussion at the Bloomberg Markets Most Influential Summit in New York. It's the job of investors to strike a proper balance between offense and defense, and between worrying about losing money and worrying about missing opportunity.Today I feel it's important to pay more attention to loss prevention than to the pursuit of gain. For the last three years Oaktree's mantra has been "move forward, but with caution." At this time, in reiterating that mantra, I would increase the emphasis on those last three words: "but with caution." Economic and company fundamentals in the U.S. are fine today, and asset prices – while full – don't seem to be at bubble levels. But when undemanding capital markets and a low level of risk aversion combine to encourage investors to engage in risky practices, something usually goes wrong eventually. Although I have no idea what could make the day of reckoning come sooner rather than later, I don't think it's too early to take today's carefree market conditions into consideration. What I do know is that those conditions are creating a degree of risk for which there is no commensurate risk premium. We have to behave accordingly. Robert Cialdini has a modest proposal. He would like businesses to carve out a new role of chief persuasion officer – or CPO for short. There is self-interest at play here. After all, Professor Cialdini is a persuasion expert and exponent of “persuasion science”. Thirty years ago, the psychologist established his credentials when he published the best-seller Influence: The Psychology of Persuasion and became known as the “godfather of influence”. As well as his academic work – today Prof Cialdini is Regents’ Professor Emeritus of Psychology and Marketing at Arizona State University – he has sold his expertise to the likes of Google, Merrill Lynch and Nato. He says “persuasion science” – which draws on psychology, neuroscience and behavioural economics – should be deployed in a systematic way. Too often its use is higgledy-piggledy and rarely based on “properly controlled, soundly conducted research” . Which is why Prof Cialdini believes that rather than leave decisions on influencing customers and employees to marketers or human resource executives, they should collaborate with expert chief persuasion officers. Now, with co-authors Steve Martin and Noah Goldstein, Prof Cialdini has published another book, The Small Big: small changes that spark big influence. As the name suggests it is about the little things business, policy makers and individuals can do to make a difference. Sept. 22 (Bloomberg) -- Michael Bloomberg, founder of Bloomberg LP and Bloomberg Philanthropies, and Ray Dalio, founder of Bridgewater Associates LP, talk about their business strategies and careers. Bloomberg's Stephanie Ruhle moderates the discussion at the Bloomberg Markets Most Influential Summit in New York. Bloomberg is also majority owner of Bloomberg LP, the parent company of Bloomberg News, and former mayor of New York City. Scott Pelley reports from the front lines in the fight against ISIS in northern Iraq, and con artists have been filing bogus tax returns and collecting millions. Steve Kroft finds out how far the scam has gone and why the IRS hasn't been able to stop it. The central point is this. The U.S. economy has shifted course from one of productive capital accumulation to a reliance on continuous expansion of debt in excess of the economic ability to repay it. Call this the Ponzi Economy. Limit yourself to the present. Understand what happens—to you, to others. Analyze what exists, break it all down: material and cause. Other people’s mistakes? Leave them to their makers. To fully explore the notion of luck, in this chapter I want to advance some ideas expressed by Nassim Nicholas Taleb in his book Fooled by Randomness. Some of the concepts I explore here occurred to me before I read it, but Taleb’s book put it all together for me and added more. I consider it one of the most important books an investor can read. Turmoil roiled Benjamin Moore, a paint company owned by Berkshire Hathaway, after it decided to break a pledge Warren Buffett made to Moore’s dealers. How did it happen—and how did the Oracle of Omaha respond? A case study in pluses (and occasional minuses) of being owned by Berkshire. Shane Parrish has finished his extensive notes from the 2014 Daily Journal Meeting. Shane is charging $32 Canadian (about $30 U.S.) for them. And while there are free notes from the meeting out there, these will be the best by a long shot. Investors are seizing the chance to lend money to US companies and municipalities for up to 100 years in exchange for a chance to capture higher yields for longer. Sales of the so-called ultra long bonds, those maturing in 50 years or longer, have exploded this year despite expectations of higher US bond yields, which may hit long-dated corporate and municipal debt. Cleveland Clinic, the Ohio-based medical and research centre giant, became on Thursday the first not-for-profit healthcare company to sell 100-year bonds....Cleveland Clinic completed the sale of $400m in securities maturing in 2114, with yields of about 4.85 per cent, compared with 3.27 per cent for the US 30-year note, according to people familiar with the sale. "You should focus relentlessly on something you're good at doing, but before that you must think hard about whether it will be valuable in the future." "...you can't trust a world that denies the power law to accurately frame your decisions for you, so what's important is rarely obvious." And if you follow this blog in an RSS reader, you may have missed the Ben Franklin stuff I added later in the day to yesterday's links, which you may want to check out. ..shortening product lives are rarely caught by reported earnings. Indeed, the appearance of rising profits from a new product may be more than offset by a reduced product life. Technology investors in the early 1980s paid dearly to learn this lesson. Our team is continually improving at knowing where to look for opportunity. Our analysts are doing some really creative work thinking about structural changes in some companies and industries, which has led to several new public equity investments. Pulling threads on existing stock investments has led to a few others...I view it as a substantial positive that our team has the background, talent, and drive to source opportunity in new areas of the markets, generally with very favorable results. I am also pleased that this old dog (your Portfolio Manager) is still open (I’m always cautious but open) to learning a few new tricks. With investment bankers and hedge fund executives canvassing Europe today to bet on recovery, you have the increasingly common circumstance of proliferating “opportunity funds,” absent only the investment opportunity. Some clients of hedge funds today are, in a sense, disintermediating themselves, funding new entities to bid higher for the same sort of assets their other, more disciplined managers are already bidding more judiciously for. The discipline problem in this case is not that of the legacy managers; it may just be that of the clients. Thiel also recommends a book by René Girard, the author that has had the biggest influence on him, Things Hidden Since the Foundation of the World. The investor’s portfolio of common stocks will represent a small cross-section of that immense and formidable institution known as the stock market. Prudence suggests that he have an adequate idea of stock-market history, in terms particularly of the major fluctuations in its price level and of the varying relationships between stock prices as a whole and their earnings and dividends. With this background he may be in a position to form some worthwhile judgment of the attractiveness or dangers of the level of the market as it presents itself at different times. From last month, but the current numbers would be even slightly higher. The outlook certainly isn't so propitious (and assets aren't so cheap) as to call for investing aggressively. But at the same time, market conditions tell me this isn't a time for hiding under the bed. 'Move forward, but with caution' -- that's my mantra today. The environment is uncertain, but we shouldn't find that paralyzing. It's the job of investors to strike a proper balance between offense and defense, and between worrying about losing money and worrying about missing opportunity. Today I feel it's important to pay more attention to loss prevention than to the pursuit of gain. For the last three years Oaktree's mantra has been "move forward, but with caution." At this time, in reiterating that mantra, I would increase the emphasis on those last three words: "but with caution." The entire pursuit of value investing requires you to see where the crowd is wrong so that you can profit from their misperceptions. The Sunday posts apparently didn't go out to all of those who subscribe by email. If you missed it, I had one slightly longer post about fundamentals, which you can find HERE. On any given trading day, only a fraction of 1% of total market capitalization changes hands, and the vast majority of that is high-frequency trading and portfolio reallocation between existing equity holders. Think about it – the only way for an investor to get out of stocks without someone else getting in is for the stock to be literally removed from the market. That source of net removal of stock is corporate repurchase activity, which recently hit a year-over-year pace of about $500 billion. That’s still less than 4% of total market cap in an entire year, and it’s a fairly good upper limit on the percentage of investors who will successfully get out of this bubble without the appearance of a miraculous multitude of greater fools at the very moment existing holders decide to sell. Notably, the heaviest repurchase activity is associated with market peaks – repurchases actually dwindle at market lows. As our friend Albert Edwards across the pond in England points out, corporate cash flow alone is not enough to finance buybacks and other corporate expenditures, so buybacks are instead typically funded primarily through debt issuance. Last week, Investors Intelligence reported that the percentage of bearish advisors has dropped to a 27-year low of 13.3%, a level last seen in 1987 a few months prior to the market crash of that year. A big thanks to Jason Zweig for mentioning me and this blog in his article Read ‘Em and Reap: Smart People for Investors to Follow. That recognition from someone I admire--and that I think just about every value investor would put near the top of their list if they made a similar one--led me to get going and put this post together, which had been brewing in my mind for a few days. I was introduced to this notion [by a] friend of mine who was friends with Wynton Marsalis, the great jazz trumpet virtuoso. And Wynton would talk about the one thing he does that nobody else does [is that] he practices fundamentals for an hour in the morning, just blowing on a reed. Things that nobody wants to do, yet he does the things that he was taught as a kid, where you think you'd have graduated from that sort of practice... And that's what separates him... He would take that hour every morning. In fact, he'd be up talking to his brother late at night and in his mind he'd say, "Man, I'm going to be tired tomorrow," because he knew no matter what, he'd wake up at six in the morning and practice for an hour the thing that nobody else would do. Process - an almost obsessive focus on process over outcome, or in the lingo of Scott Adams, on systems over goals. It's okay to set big picture goals and you need to observe outcomes in order to assess and/or improve your process, but that is a small part of the day-to-day activity of focusing on your process and the things that within your control. Ego elimination - keeping your ego out of the investing process. If you don't keep your ego out of the process, you are much more likely to fall for the psychological biases that are likely the biggest cause of investment mistakes. You can't worry about looking good. You need to worry about finding out what is true and what is not. Long-term thinking - keep a long-term outlook when it comes investing and analyzing businesses. There is a lot of noise out there, and being able to clearly focus on making long-term decisions isn't always easy. After psychological mistakes, I think the inability to be patient and look past the short-term is likely the next major cause of investment mistakes, maybe even the biggest cause. It's important to always keep reaching and keep improving one's knowledge in order to increase skill and expand one's ability. But it's also important not to stray from the fundamental framework that is necessary for sustained success. Personally, I try to do this by building the memory palaces of the most fundamental things, which I discussed in the Memortation article, and by reading or listening to just a little bit of the books that I think are the most important for my philosophy. I do this at least a few times a week, and sometimes every day of a given week. While a couple of these may change over time, and they will probably be slightly different from person to person, my current list is made up of The Intelligent Investor (with Jason Zweig's commentary), Security Analysis (6th Edition), Warren Buffett's Letters to Shareholders, Poor Charlie's Almanack, Margin of Safety, The Most Important Thing (audiobook), Modern Security Analysis, Competition Demystified, Value Investing (Greenwald), Fooled by Randomness (audiobook), Seeking Wisdom, and Thinking, Fast and Slow (audiobook). I also have a file that I've put together of reminders and thoughts I want to remember over time that is also part of the reading list. And while none of this guarantees success, it can probably help one avoid some errors, and in my experience, greatly improve one's ability to filter out some of the noise in the world. Link to article: Can Peers Burn Holes In Your Portfolio? For investors, emotions can be contagious. With U.S. stocks near record highs and European bourses sizzling, now is the time to immunize yourself against the risk that a sudden selloff will infect the markets—and you—with panic. New research helps explain how financial contagion spreads and how to protect yourself against it. Paying attention to the right people turns out to be hugely important. These examples, extreme as they are, suggest rather forcibly that the book value deserves at least a fleeting glance by the public before it buys or sells shares in a business undertaking. In any particular case the message that the book value conveys may well prove to be inconsequential and unworthy of attention. But this testimony should be examined before it is rejected. Let the stock buyer, if he lays any claim to intelligence, at least be able to tell himself, first, what value he is actually setting on the business and, second, what he is actually getting for his money in terms of tangible resources. There are indeed certain presumptions in favor of purchases made far below asset value and against those made at a high premium above it. (It is assumed that in the ordinary case the book figures may be accepted as roughly indicative of the actual cash invested in the enterprise.) A business that sells at a premium does so because it earns a large return upon its capital; this large return attracts competition, and, generally speaking, it is not likely to continue indefinitely. Conversely in the case of a business selling at a large discount because of abnormally low earnings. The absence of new competition, the withdrawal of old competition from the field, and other natural economic forces may tend eventually to improve the situation and restore a normal rate of profit on the investment. Sept. 5 (Bloomberg) -- Howard Marks, chairman of Oaktree Capital Group LLC, talks about assessing market risk, volatility and sentiment. Marks speaks with Stephanie Ruhle and Erik Schatzker on Bloomberg Television's "Market Makers." In the video above, Marks discusses his latest memo, Risk Revisited, which is one of my favorites he's written. He also mentioned his documentary recommendation site, True Films.